I wanted to do a review on the YSL Fusion Ink Foundation which is currently retailing in boots for £30.50. I’ve read so many good reviews on it but I’ve spent so much money on foundations that I just don’t use, so I wanted to test it out first before I actually brought it. The lady at the counter colour matched me and kindly let me take away two samples to try. So from left to right: L’oreal Infallible 24hr in 260, YSL Ink in BD55 and YSL Ink in BD60. I put all three on my hand just to compare the colour, because in the individual bottles they all looked virtually the same. BD55 was the closest to my L’oreal Infallible so that’s what I thought I’d try. Unfortunately, I couldn’t keep it on all day to see how it lasted throughout the day because it was the wrong colour. I had a long day too so I didn’t to be walking around all day looking the wrong colour. Maybe I’ll try it another time whilst I’m at home to test its lasting power, although it’s supposed to be a 24 hour foundation. The one thing I loved about this foundation, is that it did have a beautiful velvet matte finish. The one thing I notice straight away (I don’t know if you can tell by the picture), but around the edges, the foundation is setting on my hand pretty quickly. It also felt so lightweight, as if I wasn’t wearing anything on my skin. However, I found were that the colour range is so limited, particularly for deeper skin tones. Another thing is that the applicator is a spatula type thing which you dot directly on to your skin and then blend it in. I really didn’t like this because I prefer a pump bottle, but it’s usable. 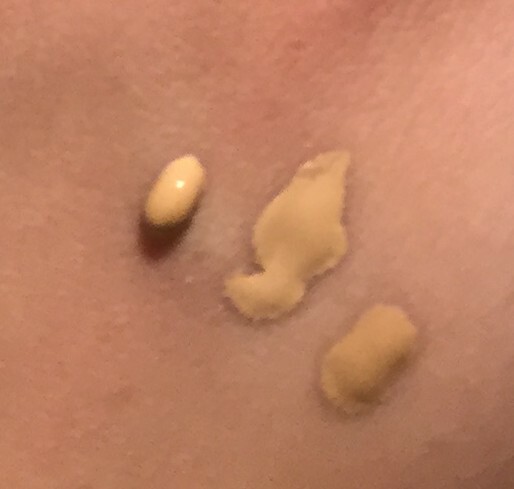 Also the main thing that I look for in a foundation is that I need it to be full coverage as I have a lot of acne scarring, and I felt as though I needed quite a few layers, and even still the coverage wasn’t that great. Have any of you tried the YSL Fusion Ink Foundation? Let me know what you think.